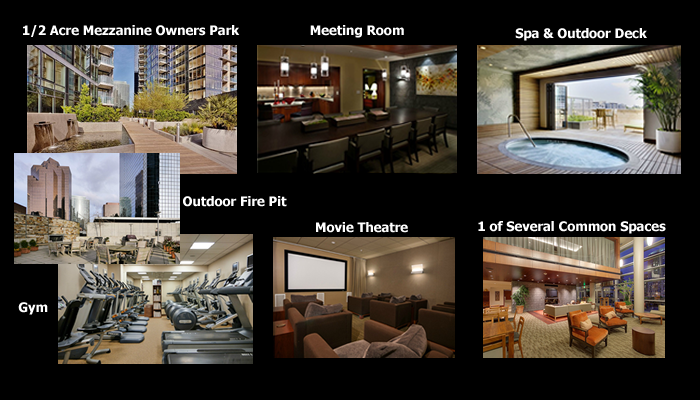 Brad Golik is a condominium specialist in downtowns Pearl District and South Waterfront. It does not cost you to work with a specialist…it pays! Today, like I do on most Tuesday’s, I went to a few brokers’ open houses to look at some new listings. After viewing a new penthouse on the market, I stopped in at a nearby coffee shop. In the coffee shop were a group of real estate agents who had also gone to the same open house. These agents were not condo agents, I know because I did not recognize any of them! What I heard come out of the mouth was not surprising because they just do not understand the urban market. The penthouse that these agents were talking about was the new listing at the Crane building priced at $1,850,000. I heard on of the agents say that she has not seen any of the other penthouses in the Pearl but she thought this one was “Exceptional and priced very well!” The others with her nodded their heads in agreement. The first thought that came to my had was…REALLY?…Is this what they would say to potential buyers that they would show the unit to? For what it is worth, here are my thoughts on this penthouse unit priced at $1,850,000. This unit was on the market one and a half years ago priced at $1,950,000 and it did not sell then. While this unit has very nice finishes, here are my reasons why I think it is priced too high. First…and most important, anything priced above $1,500,000 should not be a total fishbowl…and this unit is! Before when it was listed, you had neighbors from Avenue lofts and Irving Street lofts looking down into your 7th floor unit. Now, directly across the street to the west is a brand new office tower that takes away your views of the west hills, takes away a lot of natural daylight and also adds hundreds of office workers that can now look directly into your unit! There MUST be a discount on price for the huge lack of privacy! Some of the other negatives of this unit are that it has low ceiling height and it is a pretty choppy floor plan which gives you the feel that it is smaller than its 2239 square feet. At 836 a square foot, a buyer should get way more for their money than what is offered here. In one of my recent posts I discussed the great buy my client got on a penthouse purchase at The Elizabeth. This unit closed at $2,200,000 (fully furnished) or $667 a square foot. This unit is far superior than the penthouse at the Crane building in many, many ways. It is a much higher floor, 14 as opposed to 7 so you are above most surrounding buildings and don’t have neighbors looking down on you (something most penthouse buyers NEVER want!) The floor plan at the Elizabeth was much more desirable. In addition, both units had equal deck space for outdoor living but at the Crane penthouse, the outdoor space is almost unusable because of the freeway noise that is only a block away! 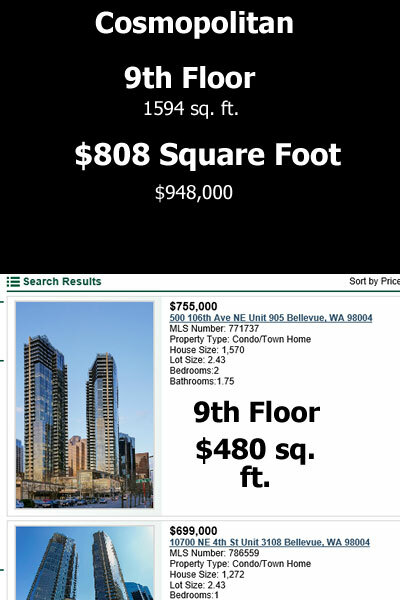 Even if my client would have gotten the Elizabeth penthouse at a higher price, say $2,500,000, the price per square foot would still have been much lower at $757 a foot. 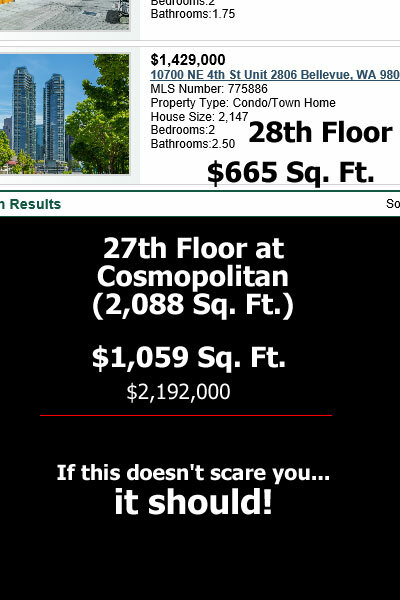 There is a huge difference in why the buyers at The Cosmopolitan are paying above $800 a square foot…that is the privacy that comes with being 25 floors or higher. Your odds of having another building going up next to you and blocking your views are much less, this is why buyers were willing to pay a premium. But, the Crane penthouse being only 7 floors up, there is no way it deserves the premium of pricing that it is at, especially with all of those new office workers looking down at you!. If I am the listing agent of this penthouse, I am hoping that one of those agents at the coffee shop brings a buyer and makes an offer… because, based on their comments, they truly don’t know any better! Is it a good time to sell my Portland condominium? 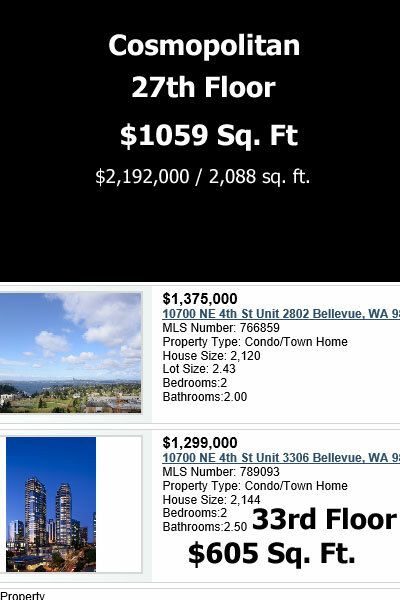 For those of you who might be thinking it’s a good time to sell your Portland condominium…you are right! Inventory levels are at historically low levels right now. Yes, the sellers are back in control over the market currently. If you think you want to sell, the best thing you have going for you right now is the low inventory levels we have currently. You will be able to push your price a little and capture a bit of a premium because of the low inventory levels. If you are a buyer, you need to react quickly when you find a condo on the market you like because if you hesitate, you could lose out. With that said, I believe buyers are being a little smarter this time around and not chasing deals with excessive multiple offer situations. In other words they are being much more patient. While they might not get the unit they want, this time around they are willing to wait for the right one to come along without getting into a bidding situation. What about the new Cosmopolitan? Well you have heard us talking about the prices at the Cosmopolitan a bit. The prices they are asking will actually give sellers a window of opportunity to push the price a little as well. If the Cosmopolitan is asking $800 a square foot for a unit, it is a little easier for a seller to push their price from $590 a square foot to $610. Stay tuned for our latest Cosmopolitan update…coming soon!